Marine-blue cord Trachten necklace with pendant. The right accessory is the icing on the cake of a perfect look. This subtle necklace by Schuhmacher turns heads with its large heart-shaped pendant engraved in an edelweiss motif and floral pattern. 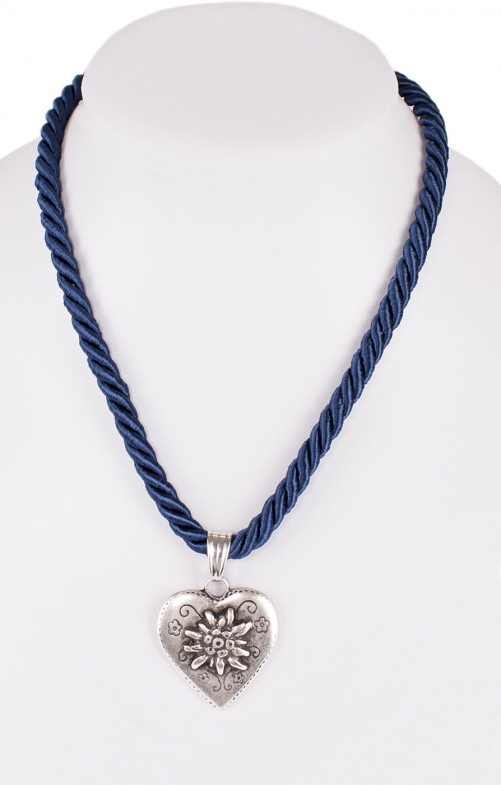 With its old-silver finish, this metal pendant complements the twisted, gently shimmering satin cord in velvety blue. The necklace can also be adjusted to individual tastes, thanks to the small, adjustable lobster clasp. Whether worn with a dirndl or an elegant white blouse, this traditional piece by Schuhmacher is a contemporary, feminine accessory and adds a stylish breath of fresh air to Trachten outfits. Ideal for fancy girls with a sense of style. sieht schick aus und passt perfekt zu meinem Outfit. Kette ist sehr schön, würde ich wieder bestellen. Qualität und Verarbeitung ist gut. Auch über den Preis kann man nicht meckern. Top. Gerne wieder. Sehr schöne Kette, mit verstellbaren Verschluss. Kordel ist angenehm auf der Haut und stört in keinerlei Hinsicht.